If you like innovation, if you love exploring, and if are looking to buy a small SUV, then the 2015 Jeep Renegade must be on your shopping list. Jeep® is offering two models of the Renegade: Trailhawk and Latitude. Both are excellent choices for off-roading or even driving in extreme conditions, but the Trailhawk has best-in-class 4x4 capabilities. The 2015 Jeep Renegade gives you the tools to go on some of the greatest adventures of your life. As a standard in the Trailhawk edition and as an option for the Latitude, Jeep® has equipped the Renegade with a Jeep Active Drive (AWD) system as well as a Selec-Terrain® system. The Jeep Active Drive comes with a low gear and the Selec-Terrain® system has five modes (four in the Latitude) for various terrain conditions: automatic, snow, sand, mud, and rock. However, the engines are impressive too. The Latitude has a turbocharged 1.4L four-cylinder engine with 160 horsepower and the Trailhawk has a 2.4L Tigershark® four-cylinder engine with 184 horsepower and an automatic nine-speed transmission. There is also an available six-speed manual transmission. The 2015 Jeep Renegade has an "Tek-Tonic" design, which incorporates various hard and soft materials, structural elements, vibrant colors, and storage space for your extreme sporting gear. Matched with an interior trim color, the body of the Renegade comes in various colors, including orange, red, and silver. 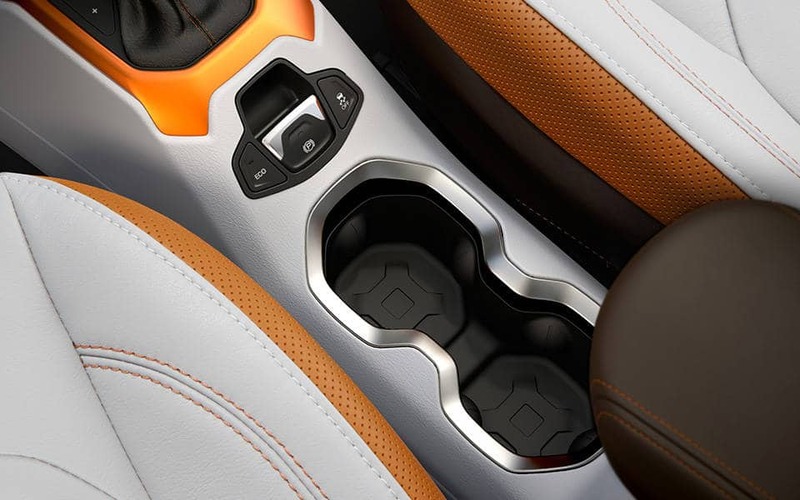 For driving comfort, the steering wheel is wrapped in leather and it is heated. You can even personalize the display screen. 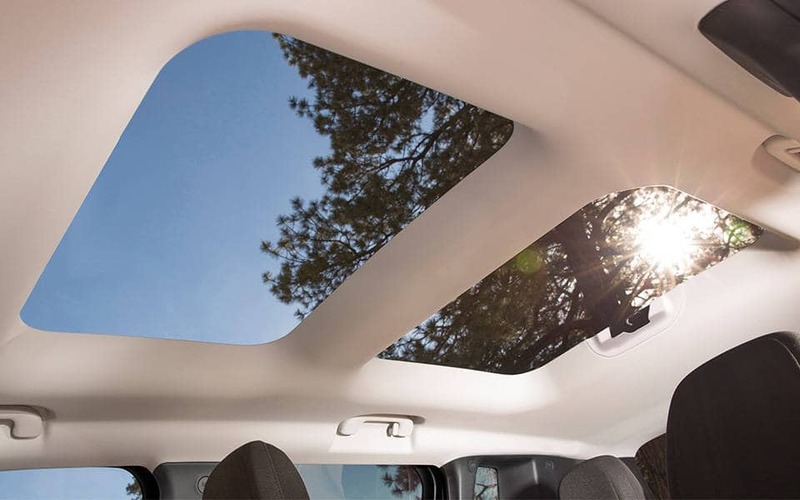 The My Sky sunroof system has dual panels that you can remove manually or you can upgrade to a premium tilt and slide system. The windshield also has a sunglass tint to protect your vision while driving. If innovative technology is a must-have for you, then you can opt for an available 5- or 6.5-inch Uconnect® Touchscreen System that has many features, including Bluetooth connectivity, streaming music, built-in GPS navigator, and much more. Jeep® is calling the 2015 Renegade a "small-wide 4x4" with its structure being nearly 2 inches less than the Buick Encore and 5 inches longer than the Honda Fit. The 2015 Jeep Renegade has more than 70 safety features that make you feel secure whether you are playing it safe or living on the edge. Some features include ParkView® Rear Backup Camera, Forward Collision Warning, Rear Cross-Path Detection, hill decent control, blind spot warning, and lane departure warning.